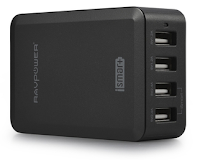 RAVPower has always been in the business of providing accessories for tablets and smartphone and everyone knows that I'm a sucker for them. This is the RAVPower 36W which offers 7.2A of power for 4 ports. The first 2 ports are labeled and can push out up to 2.1A which gives you a 4.2A total leaving you with 3A for the remaining 2 ports. Plenty of power to charge, your smartphones, accessories, tablets and even portable battery chargers. If you need one of those charging station I'd go for it, I got mine for 19,99$ and this was the best alternative price wise. This compact all around desktop charger is the perfect companion to take with you on your day to day operations. It's the best friend for the camping nerd or even just for the kids that ultimately demand power for their tech toys.